In an incredibly tight contest that was decided in the final minute, the Boks carried less, made more errors and kicked less, yet sneaked a win over France in Paris. No doubt there will be much doom and gloom and there is certainly much to complain about, but too my mind the “finishing stats” are the most significant! Had we managed to finish both disallowed tries the result would have looked quite different! The fact that we created those opportunities is a big positive! The personal stats will give us more – there is an urgent need for change in some positions! What a pathetic show again.This team has not moved forward one iota in 12 tests. Here they played a team that first came together a week or so ago and were clearly the better team on the field. Rassie the ‘meticulous planner’ has had the Boks for 6 months and they still looked like they’d never played together before. Forget the Nigella inspired last gasp win it was the dross in the 70 minutes that preceded it when the Boks struggled to get a coherent game plan going that has left us wondering just what the hell is actually going on here. Must be the luckiest 50% win ratio by a coach on record. All the usual suspects were suspect again. Pollard still can’t get any creativity into his game. Willie and Faf looked like they didn’t even want to be there. Wings never saw the ball. Centres were plodding around all game. What Kriel has done in the last two tests is a mystery. As the SS panel show rightly pointed out, when the much maligned Jantjies finally came on the backline had a better shape and look far more threatening. No surprise to me of course. The forwards collectively were workmanlike but despite the promise of taking them apart in the set pieces we never stole a lineout or dominated their scrums at all. This against a quite inexperienced pack playing together for the first time after a very short preparation period. Not good enough. The stats tells it’s own story. Old ‘smiling Joe’ Rassie at the end of this match was fooling no one with his oh so congenial manner, he was staring down the barrel of a gun and he knew it. But I suppose his six year contract must give him some solace and a feeling of untouchability. Only problem is he doesn’t know what this roller coaster ride is doing to the fans who are being frustrated no end and would love to see some real progress. Rassie has, as predicted, completely painted himself into a corner now. His transformation imperatives are nowhere near being acceptable to his ‘masters’ and only five tests remain before we meet NZ at the WC. His love affair with the overseas contingent is fast being undermined despite Francois Louw finally deciding to earn his fat salary with a few steals. Only DV put in a real effort. Kolbe of course being unable to capitalize on a standard winger scoring opportunity after being ‘klapped’ in the final tackle and Willies unforgivable forward pass for the Dyantyi ‘no try’ showing just why I believe ‘experience’ is overrated. ER will now be forced to bring in the ‘newbies’ for the next two tests and address the ‘quota’ shortfall. Meticulous planner ? Yeah right. And finally for those who thought the South will once more. march over the North I think the results this weekend will debunk that theory. Four of the Six Nations teams won and but for the rugby Gods smiling down on the AB’s and the Boks it could well have been 6 from 6. Eddie Jones as wily as ever and Rassie as lucky as ever. We can just thank our lucky stars that we don’t play Ireland on this tour. And for those who are going to criticize my ‘same old, same old’ story please remember it’s Rassie’s Boks with the same old, same old story that’s the problem here not me. Cheers. Yay, the Hermanator is back. I assume the only thing you’re positive about is the light at the end of your tunnel. You are part of the problem that rugby (globally) faces today – too many couch potatoes who judge from the comfort of their lazy boy. Then nothing will change. Einstein’s theory applies, you know the one about doing the same thing over and over and expecting a different result ? If you accept mediocrity you will also get nothing but mediocrity. Your standards must be pretty low old chap. There are others who challenged the status quo otherwise Mandela may have died in prison and Zuma would still be No 1 in charge of SA. Both would have been catastrophic if it came to pass. By the way if my being a couch potato threatens world rugby then world rugby is really in a bad way, lol. Or maybe it’s in a bad way because people like you meekly accept all the c..p dealt out to them ? Please chill my good man this is how I have coped since 2014 with the never ending cycle of mediocrity that is Bok rugby. In case you are not aware of it the Boks have not won a meaningful trophy since 2009 and in 2018 we still cannot produce intelligent skilled players and decent results on a world stage we once dominated. But according to you we must just smile and bear it and all will be well. Not going to happen, we have the wrong people in charge. Join the club. Cheers. Ie, don’t sit behind a screen and complain. What are YOU doing about it? If you’re not part of the solution, then complaining. I didn’t say World Rugby, I said “rugby (globally)”. I’m not referring to the institution but rather the faceless moaners who will never be happy. Can’t imagine you having the spine to say half the things you do to the coaches/players faces. So ‘almost’ counts these days does it ?? AC almost beat the AB’s as well and he was kicked out. AC also beat the French 3 – 0 last year and was kicked out. AC only lost 4 tests last year, our man in charge 6 already and but for the miracle of Wellington and Saturday could well have been 8, to use your ‘almost’ argument. AC was useless so where does it put ER ( Emergency Room ) ? A depleted England in SA and at Twickenham ( 17 missing ) and Rassie ends up only 2 wins apiece ? Strong French side ? One week to prepare and but for the benevolence of good old Nige should have beaten the still woeful Boks. A classic Bok implosion at Loftus ? Who’s fooling who here. By the way social media and quite a few scribes seem to agree with me. If Rassie was never a National coach why did he get the job ? Or do we use test matches to train head coaches these days like we do some of our unskilled players ? Making mistakes is one thing but repeating them week in and week out is quite another. He also bought into transformation with eyes wide open and got the job based on his promises. All good and well so why is he not filling the quotas ? Handing out caps left right and centre to players making limited cameo appearances is not transformation it’s window dressing. No Sir your standards are way too low so you probably need a bit more enlightenment. Keep reading my posts so that when Bok rugby finally abandons dom krag rugby we can step into the light together. At the moment it’s a ‘train’ smash. Cheers. With the exception of some outrageous ref-ing in the England test, we would be looking at two from two – would be the “glass half full” version! But hell why be positive!!! Please read my responses to D John and SweetAz above for the other side of the coin. Cheers. We were told to be positive with HM, no luck. We were told to be positive with AC to no avail. We are now told to be positive with Rassie who now boasts a record even worse than AC. As I’ve told D John and SweetAz above why did Rassie not build on AC’s 2017 foundation ? Or is he more useless than AC ? Instead he brings in an army of mercenaries some of whom don’t seem to even want to be here or if they do are stymied by their employers. For further amplification please refer to my posts to the above mentioned. Cheers. Ah, just for Herman, lol. From a personal stats perspective the centre pairing remains an issue. Last week DDA’s single pass in 80 got much coverage. He was better this week with 6 passes, but other than that he was largely anonymous! Though Kriel determined not to let their stats slip, picked up on this and delivered a single pass from 11 runs! Surely we must see changes!!!! Defensively we were good across the board, but some concern that most of the traffic was handled by the tight forwards, whilst the loosies were in the background. Should it not surely be the other way around. How is it that our tight head makes more tackles than our loosies? Your WW take is not terribly objective Tank. I elaborated in a reply to your earlier post which you have not responded to, Kindly let me have your thoughts. Cheers. Agreed, all three Du Preez now in the UK on contract, so he saves the air ticket. I think pipe dreams though, he’ll go with PSDT, Notshe and Thor?? I hate our centres at the moment. They have no idea what space is. They don’t know how to create it, how to exploit it or how to utilize it. What is the use of such talented wingers if our centres don’t know how to pass. My kingdom for passing centres! Maybe Ruhan Nel needs a look into? Whiteley again anonymous with a mere 2 carries in 40mins. What has happened to the linking 8 we were sold. When have we last seen our 8 carry up from the Base? Kolisi delivered yet another well below par performance. Carry stats are usually huge but at present almost none existent! He needs a break! Lastly a mere 5 offloads in the entire game. What has happened to this aspect of our attack?…. And the Du Prees twins look on from Durban beach!! I just dont know how to call it anymore, honestly i think we should perhaps shelve this choose this player and that player talk, because nobody actually have a clue anymore how things will pan out… Whiteley was inmense in NZ but totally nowhere yesterday. Vermeulen no impact last week and quite imposing this week. DDA good last week and nowhere yesterday. Bongi looking more solid at setpiece, Marx dominating again in the loose. Faf punted as the best in the world and then not? Wheres the continuity in the players? We play du Preez twins and then they perhaps absolute liability for the Boks? Im sure behind the scenes Rassie pulling his hair out at the choices he is to make after every game… Stats tell you a lot on gameplay but again the scoreboard reflects differently. I doubt the stats from yesterday is enough to soothe Brunel to sleep this week. Its a win, according to Hermie that’s all that counts so I don’t know why he has to write a book about it.. After all, AC had a great win percentage (according to him). All you can read from this game and other games this weekend is that the top 8 teams in the world have closed the gap on each other, even Ireland struggled. In fact, but for a bit of luck SA could be 2-nil up on this tour and actually looked much better than the AB’s did against the English. It makes for a great RWC where it’s going to be very open and that’s a good thing for World Rugby. But then I’m a glass-half-full kinda guy,—some people on here don’t seem to even know where they left their glasses. As far as the Boks are concerned there isn’t even a glass in sight old man, never mind a half empty one. Clutching at straws is more like it SweetAz and what you consider acceptable is way below what I consider where the once proud Bok jersey should be. If you’re happy with mediocrity then good luck to you. Cheers. Being honest in calling out the delusion that all races are the same does not make me a pessimist mate, it is but one small aspect in the kaleidoscope of life. It’s only the “chip-on-shoulder” brigade and various SJW’s that focus on individual aspects to the exclusion to all else that get hung up on it. Reality really does not care about your “feelings”. No no, no slowflake. Just asking. I know they dont have to host my comment, would just like to know where they stand on it. Calm down Adolf. You are right, we spend so much time on introspection that we forget to acknowledge that the French were very good on the day and must be gutted with the result! There is much wrong, but there is enough right to have got the win. Qed. Yep, this French team came very close to beating Ireland in the 6 Nations and England who came 5th out of the 6 Nations was a refereeing mistake away from beating the AB’s yesterday. I was especially impressed with how the French pack cleared out and hunted as a pack the first half, it really showed up the deficiencies and imbalance of having Whitely in a starting role with PSDT at lock. We needed a “tighter” loose trio for that first half, Whitely would probably have been better coming on as an impact player. Marx was pretty inconspicuous and to my mind and would probably have been better as an impact player as well, sacrilegious to say for a “racist”, but Mbonambi would have been a better starter to take the heat out of that French pack. I’m not a Jantjies fan but there is merit in starting him and Pollard together. I think they actually complement each other, the backline seemed to find more space with that combo. With Willie at fullback that puts 3 playmakers on allowing you to be a lot more innovative as well as creating more doubt in the defences mind. With Willemse on the bench, you have your reserve flyhalf covering fullback and Willie is a retreaded flyhalf anyway. Not one mention of Hermie ? Wow take a bow old chap. Why do you think the Boks have been so inconsistent and mediocre these past few months ? Skills and execution still in short supply as I’ve been pointing out for years now, never mind months. Players like WW thrive on open play and you need a loose forward with some rugby nous and skill to capitalize on try scoring opportunities. His two ‘flick on’ passes for two Bok tries this year ample proof of that. Would DV, Louw,or even PSdT have been capable of that ? Not by my reckoning. By the way WW’s record as being the toughest of competitors, with the stats to match that in both SR and tests, rubbishes your ‘non starter’ call. One game where everyone was pretty poor and he must make way for another plodder ? Pick a balanced team with a progressive game plan and the rest will follow. But of course we all know only special coaches can coach the modern game effectively and we already know that Rassie does not qualify on that score, hence our constant brain dead game plan. Thanks for the vote of confidence for Jantjies by the way ( as I’ve been saying since June anyway ) but please don’t surround him with plodders and a now failed dom krag game plan. ( By the way by ‘plodder’s I mean ‘dom krag specialists’ ). 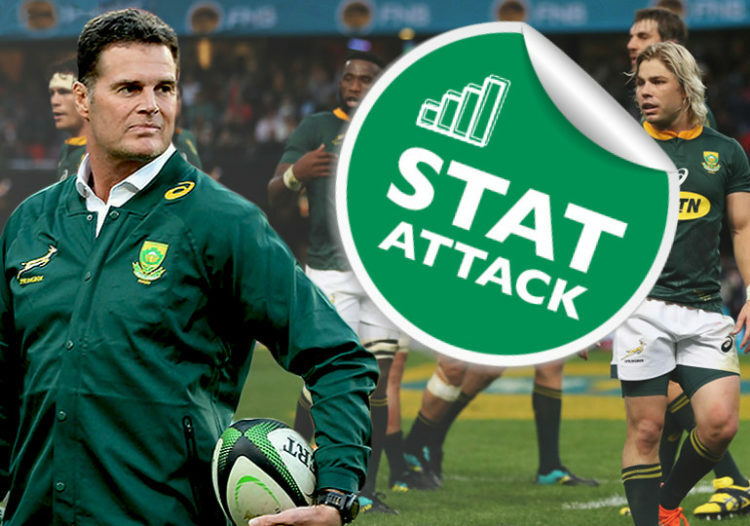 Rassie has now not only to address his transformation shortcomings in the coming tests he will actually have to find a game plan to stop the rot. So much for the meticulous planner hey, lol. Your call for more creativity is laudable but haven’t I been beating that drum for years now ? By pushing for Jantjies you admit Pollard is too one dimensional not so ? Then why has he been picked for the major portion of tests this year ? I’ll answer for you. He fits the coaches dom krag ideal and our poor to average results proves it’s failure. Mr SweetAz you can amplify Mbonambi’s contribution all you like but my grandmother could have scored that try behind that pack. Marx has of course done it countless times and as Mallett said when you pick a Bok team Marx is the first name on the list. IMO the man is out on his feet. While other Boks were ‘resting’ ( due to failed SR campaigns ) Marx played three additional SR qualifying games. By all means rest him on Saturday. Ok my good man so to summarize the Boks are still in the doldrums as predicted and Rassie is falling short as predicted. The game plan isn’t working as predicted and selections to suit that failed game plan isn’t working as predicted. I won’t take credit for my predictions though Nostradamus predicted it centuries ago. I am only his messenger. Cheers. The Sherry is for cooking mate,-stop drinking it. Tank you are underestimating his defensive capabilities. like anyone small of stature he will be steamrolled by the big boys from time to time, who hasn’t. The difference is he doesn’t shy away from those duties like some. Watch DDA for example and you will see what I call selective tackling. Hot in pursuit or faced with a big boy he will slow down or crab to avoid contact. Not obvious at the time but subtle avoidance. There are quite a few of those around by the way. Teflon Jantjies has been hammered by the best of them but just gets up and gets on with it. Others like fragile Pollard and the Lambies of the world spend more time in doctor’s waiting rooms than playing rugby it seems. So when the tackle stats are perused Jantjies may not be high on the list but he never ducked and dived any either. The ‘avoiders’ however come up smelling like roses. That’s why I don’t believe in stats as a measure of a man’s true capabilities. Other countries ‘protect’ their flyhalves for good reason, Jantjies asks for non of that he just gives his all. His other talents when utilized properly in a non dom krag environment far outweigh any shortcomings he may have. Let’s be honest here if he had started every test this year would we have been any worse of than we are now ? I don’t think so. Lack of BMT is always used to describe him but BB’s brain explosion in Wellington and Pollard at Loftus proves anyone can have an off day. Pollards knock on last Saturday not mentioned at all but if that was Jantjies he would have been hung and quartered especially if we had lost. He remains the only truly creative flyhalf in SA but due to our outdated game plan continues to warm the bench. What a waste while the Boks stumble on. Cheers. PS : Willemse not ready for the big time. Let’s see how he and others handle SR for a season or two before elevating them to unproven superstar status. Rassie’s ‘love affair’ with this guy is quite puzzling in fact. Maybe it’s his Stormers background ? Rassie seems to really favour those blokes and the Boks struggle on despite their majority presence. Also quite puzzling. Cheers again.